Converting lobbies from waiting areas to thoughtful spaces, hotel chains are hoping to keep you hooked. Top hotel chains around the world have recognised that a hotel lobby is more than just dead space to while away time. With this in mind, the new focus is on recrafting these spaces as engaging recreational and food zones. After Holiday Inn and Hilton raised the stakes at their properties in the United States, Le Meridien has joined the pack of progressive hoteliers determined to up the lobby ante. Aesthetics and stylised interiors aside, the hotel chain plans to revamp their reception, replacing mundane seating areas with a conceptual space called the Le Meridien Hub. The Hub will feature art installations accompanied by projections and soundscapes designed to have an immediate impact on visitors. There will also be libraries and an interaction area where the larger community can discuss and debate culturally relevant ideas. The space will also accommodate a bar serving signature coffees through the day and a wine-inspired menu in the evenings. From being mere decorative facades, hotel lobbies will soon be transformed into exciting, interactive spaces that define the identity of a hotel property. Step inside and prepare to be swept away. US travel magazine, Travel + Leisure, in its recent 2011 World's Best Awards, named Bangkok the best city in the world. This decision was based on thousands of votes filed by the readers of the popular magazine. Despite the internal civil unrest in Thailand, this is the second year running that the city has held on to its top spot. Book your tickets. Centuries after Michelangelo's death, the man is still causing controversy. A work depicting the crucifixion has recently been unearthed. The painting, attributed to Marcelo Venusti up till this point, was identified as Michelangelo's work by historian and conservationist Antonio Forcellino, who made the discovery with the aid of technologically advanced infrared cameras. For all these years, it had been hanging in one of the residences at the University of Oxford without a soul knowing of its heritage. Titled Crucifixion With The Madonna, St John And Two Mourning Angels, the painting has been shifted to the Ashmolean museum. According to a study in Britain, one partner in about 50 percent of all couples loses between one and five hours of sleep because the other partner snores. If you do the maths, that can work out to up to a decade of sleeplessness over a lifetime. After years of failed remedies and permutation-combination-solutions, Crowne Plaza Hotels might have come up with the answer to this problem. The group recently held a trial of its scientifically designed 'snore absorption' rooms in London, and is analysing data from the experiment to see if this could work. The rooms are outfitted with technology features that have been tried and tested to tackle the problem: soundproof walls eliminate reverberations, a sound absorbing headboard minimises the transfer of sound waves, a white noise machine drowns out snores for the person being kept awake, and an anti-snoring bed wedge and pillow inserted with magnetic fields minimise the snores. Keep your ears plugged and fingers crossed, while they try to end your sleepless nights. Luis Fonsi, Tierra Firme He has been churning out an album a year over the past decade and his latest release proves he is still capable of surprising us. LMFAO, Sorry for Party Rocking They're already on every iPod and in heavy club and radio rotation. Like their popular single, the entire album is addictive. Incubus, If Not Now, When? After a five-year hiatus, Incubus makes a comeback with the promise of change. More experimental than their alt-funkrock so keep an open mind and ear. Beyonce, 4 The diva's fourth album is aptly titled. This new set of a dozen tracks is a hybrid of R&B and pop with some crazy cool collaborations. Battles, Gloss Drop Despite guitarist and singer Braxton dropping out, the band pulled in some musical heavyweights to plug the gap. 1. Ganesh Chaturthi September 1 marks the birthday of Lord Ganesh. His devotees revere him with a host of festivities, especially in Maharashtra. 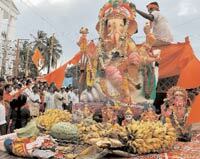 The day begins by adorning clay idols of Ganesh with garlands, followed by colourful processions through the streets. This is accompanied by drum beats, dancing and devotional chanting and it all culminates in a grand immersion. 2. New York Film Festival Held annually since 1963, this year's 49th film festival will take place from September 30 to October 16. The goal is to imbibe fresh talent from the far reaches of the cinematic world into mainstream movie making and also to provide a platform for film makers from around the globe to showcase their talent. The fest screens official selections followed by interaction with cast and crew. 3. Autumn auction of modern and contemporary art Saffronart and Mercedes-Benz team up in an auction which helps the audience explore and engage with the changing face of luxury in India. Events will be hosted in Mumbai and New Delhi, alongside the auction which goes online September 21 and 22. 4. Italian Grand Prix One of the oldest dating events on the motor racing calendar, this year's race will be held from September 9 to 11 in Monza. There's an added bonus this year as artist Jamiroquai gets set to perform at the event. 5. Oktoberfest 2011 It's the perfect occasion for beer lovers to quaff vast quantities of their favourite ale or lager without guilt. The merry festival is packed with fun activities along with yum beers. Held from September 17 to October 3 in Germany. 6. London Design Festival Now in its ninth year, the festival promises to be more cutting edge than ever. Over 250 displays, installations and events from September 17 to 25. Make sure you're there to experience the ineffable beauty and efficiency of modern design.